The blue-banded goby or Lythrypnus dalli is a member the family Gobiidae. These intensely colorful fish are native to the Eastern Pacific Ocean and the coastline of California. It is, in fact, often referred to as the Catalina goby. Collectively gobies constitute one of the largest groupings of fish on the planet. The group is comprised of 267 assorted genera and 2,100 individual species. There are even freshwater gobies but all but about 200 are saltwater varieties. Of those, gobies most commonly live a demersal existence inhabiting tropical and sub-tropical reef eco-systems. Saltwater faring gobies are renowned for their near symbiotic relationships with crustaceans, sponges, and sea urchins. Of the entire spectrum of bottom-dwelling creatures you can add to a reef tank, it is the goby that is most likely to end up becoming the center of attention. The blue-banded goby is a small fish only reaching a length of 2-2.5 inches when fully grown. 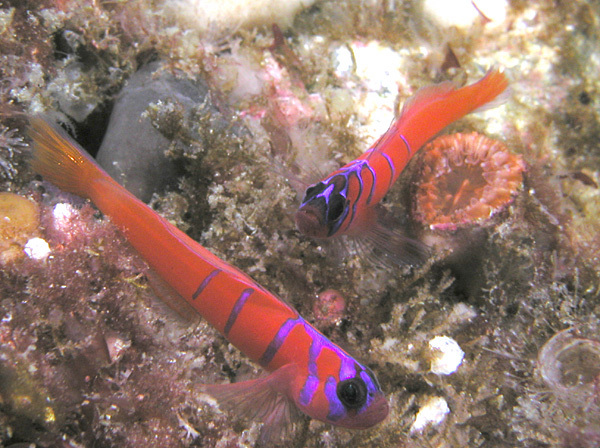 They are cylindrical bodied species with bright reddish-orange coloring and rather unique looking neon blue vertical banding starting at their heads and working its way back to their mid-body. Like other gobies, you will never see the Catalina goby stray too far from its sanctuary. In a reef tank, you will often see them sunning themselves on rocks or hiding under the friendly protection of a sea urchin. Gobies are exceedingly docile creatures. They make excellent additions to any reef tank provided their tank mates are equally mild-mannered. Unlike many bottom dwellers, the blue-banded goby exhibits no territorial behavior toward members of its own species. You can add as many to your reef tank as you please as long as there are enough hiding places and food to accommodate a thriving, bottom-dwelling community. These are a short-lived creature. They generally only live about 18 months. Warmer water temperatures seem to expedite their expiration date. If it is conducive to the other members of the reef, it is recommended that the water temperature is kept between 68-72°F. These are a carnivorous species. They will remain quite hardy throughout the remainder of their limited lifespan if fed vitamin enriched brine shrimp, or a similar commercially raised live crustacean. They will also eat frozen marine food formulated for carnivores. They have even been known to develop a taste for marine flake food. Unlike much marine fish, gobies frequently spawn in captivity. Although they have similar color palettes, you will find that you can distinguish between male and female blue-banded gobies with a little practice. If you look closely you will see that some of them have slightly longer dorsal fins than others. These are the males of the species. Determining the sexes is not essential to the prorogation of the species. Gobies are bi-gendered. If there are no males present in a group of gobies a hormonal surge will be triggered in the most dominant female until she undergoes the transformation into a male. Females will instinctively deposit their eggs in an empty shell or any of the various other hiding places you provide for them. The male will then guard the eggs until they hatch. Fry can be fed liquid or powdered marine food developed hatchlings. When they grow a little bigger they can be fed newly hatched brine shrimp. The hottest new trend in saltwater aquarium ownership is pet jellyfish. Jellyfish can't be kept in a traditional saltwater tank setup. They need specially designed Jellyfish Fish Tank Aquariums to remain alive and healthy. Jellyfish tanks don't require the constant upkeep normally associated with saltwater aquariums. Moon Jellies are the most popular jellyfish for home aquariums because of their exotic beauty and ease of care. Find out more about Moon Jellyfish and other Pet Jellies. Jellyfish are among the most interesting creatures in the aquatic kingdom.